…it is the holy faith, specifically referring to the body of truth from God handed over to faithful ones, the Christian apostolic tradition that is normative for the true people of God. The words following that are dependent on it are in the dative case and indicate for the most part either the one against whom one is fighting, or the person or thing upon which one depends for support in a fight. “the faith”- not the historical traditions per se, as a body of truth doctrines given to a faithful few, as in behalf of all the others, but the once for all “faith” given once and for all to each believer who resides in Christ) once ( adv. once, one time; once for all time;) having been handed over This is definitely the functional work of God the Holy Spirit. once and for all time in the NT is then a technical term for the definitiveness and therefore the uniqueness or singularity of the death of Christ and the redemption accomplished by it. YLT Hebrews 10:2 since, would they not have ceased to be offered, because of those serving having no more conscience of sins, having once been purified? The Epistle of Jude formulates the thought of Christian cleansing in a manner of a “once-for-all-time definitive event;” whereas Hebrews 10.2, speaks of a once-for-all-time cleansing as a being declared ritually acceptable, but cleansing salvation is stated in hypothetical terms while referring to the Jews. In the cultus sacrificial system of Judaism there was no once-for-all-time purification and salvation, because there was no once-for-all sacrifice apart from Christ; but Christianity has both. Christianity is now the faith once-for-all-time handed over to the holy( consecrated) ones. Christians are a people who are born from heaven, and are individually given every knowledge necessary for salvation, and who are therefore, according to Jude, possess it, and are in no danger of losing it. The thought is thus quite different from that of Epistle to the Hebrews, the unique redemption of Israel out of Egypt is here to be interpreted as a prototype of the one definitive redemption by Christ. In most NT passages the sense is that of wishing, desiring, or intending, often with something of all three. These are the ways the expression can be taken here. reference the author intends to make is not merely to a collection of traditions. This is a reference to the faith which was once-for-all-time handed over to the believer by the work of the Holy Spirit, coming alongside to manifestly deliver it at salvation, making it unnecessary to expound at length or to persuade by extensive argument. believer in Christ eventfully receives at the moment of conversion; this is the faith to which Jude is prompting the believer to remember. 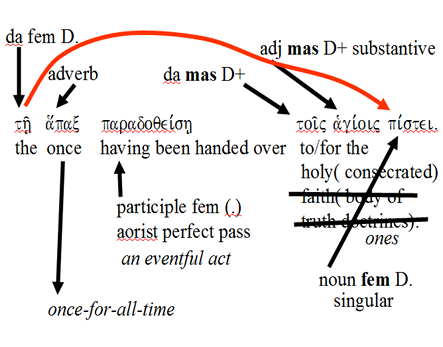 while you have continued knowing all these things from the beginning (of your faith), [perfect tense] The perfect tense is a complex expression that references the occurrence of a past event and views the accomplished outcome of that event from the perspective of its abiding results presently affecting the party (or parties) involved. This one-for-all event that had happened in the past, was when “the faith” was handed over ( ) to the believer by the paraclete ( ); namely, by God the Holy Spirit, and the accomplished outcome was salvation, to which the Holy Spirit has continued to minister by providing not just intellectual insight, but spiritual truth insight coming from the Holy Spirit, who has been active in this process ever since the beginning event of the believer’s conversion, as He bears positive abiding results which have accrued to the present time, and are promised to continue into the future. ( a people; a nation; a crowd). This reference in Scripture is always to the Jews, or to the Jews as the church, or the people of God; but to non-Jews the descriptive term that was always used later when referring to a crowd of Christians was . The word is used without the definite article here, thus indicating “a people”, of whom not all of the ones who left Egypt were believers. The reference of is a technical term for Israel, and is always a reference to the Jewish population; when it is to a non-Jewish crowd of Christians it is always , not . At first when the believing crowds are Jewish, is used, later as the shift takes place to Christian crowds, they are become . The little key-word (adv. once, one time; once-for- all-time) is again used here to refer to a people as a body of believers who had been saved out from the land of Egypt. The distinction between the true believer and those of the crowd who would not believe is made clear: Jude refers to those unbelievers who were later destroyed, while those that constituted a people to God had been once ( adv. once, one time; once-for-all-time) out of the land of Egypt, He had saved. afterwards were (still) not believing, He had destroyed ( ). This pattern is seen to have been established by God throughout redemptive history; some are believing [an event 1]; therefore, once saved, always saved; and some are condemned [an event 2]. Since those who were destroyed were among the great number of individuals who had originally been saved out of Egypt, it is clear that Jude is not talking about salvation limited to common grace, physical salvation; but to a once-for-all-time spiritual salvation, and not to some number from among the saved who had subsequently lost their salvation. This is how Jude makes the distinction and the reminder to his readers and to himself of the power of once-for-all-time saving faith. We might also recall another circumstance where Jesus sharpened His warning to the hard of heart and stiff of neck people of Capernaum, who had witnessed first-hand that Jesus’ had performed great divine miracles of salvation and healing, yet most of these people still refused to believe. ( to destroy) God does not play a passive role as One who loses something when people refuse to believe such powerful testimony to His ability to save. But at the appropriate time after giving every opportunity to believe, He exercises the supremely active function of Judge. His role is active in both protecting and in A primary example of this is found, again in the event of the Passover( cover-over). destroying, even if He should assign that task to another.